We laughed, we cried, and we celebrated Pinoy music. 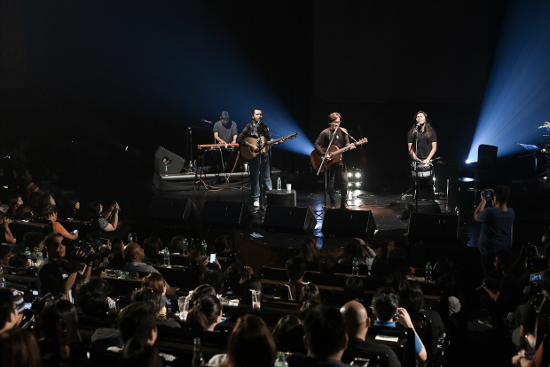 (SPOT.ph) Everyone in the jam-packed Music Museum in Greenhills was in a celebratory mood on Friday, February 19 at the sold out 3D: DAMA Anniversary Concert of singer-songwriters Johnoy Danao, Ebe Dancel, and Bullet Dumas. The trio has been taking over local bars (and has even performed in Singapore) for the past year, showing audiences their individual styles as well as their effortlessly harmonious group dynamic. On Friday, Danao, Dancel, and Dumas, along with the Manila String Machine, the show’s musical director Ronald Tomas, Niki Cabardo on keyboards, and the music-loving crowd, celebrated a year of making beautiful music together. DAMA did what it intended to do—to make everyone in the venue feel everything from joy to pain, love to longing, and more. Check out these scenes from the music event to definitely remember. 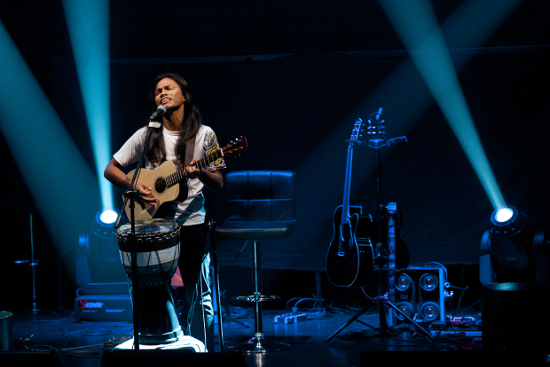 Dumas kicked off the night with "Limguhit," a bare-it-all, poetic piece that grips the audience from start to finish. He followed it up with everyone's favorite "Psst!" and was then joined by the Manila String Machine for the goosebumps-inducing "Galit." Later on, he asked the crowd to join him in singing the nostalgic "Dati, Tol." 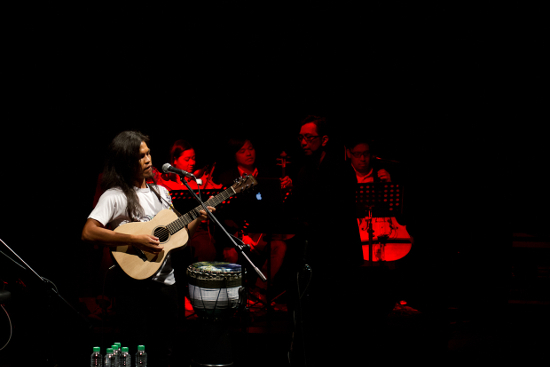 Perhaps the highlight of Dumas' set, aside from his kengkoy demeanor (you've probably witnessed this yourself if you've been to his gigs), was his performance of the love song, "Tugtog," which he—mustering all courage and with the endless coaxing of the audience—dedicated to fellow musician Clara Benin. 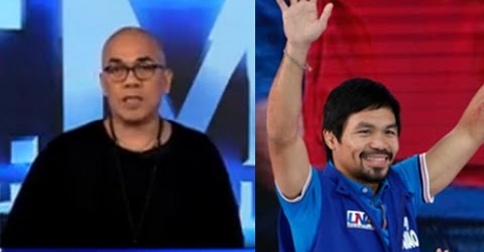 "Noong sinusulat ko 'to, may isa akong taong iniisip. Kinanta ko na 'to with her. Putang ina, bakit ko 'to ginagawa?" Dumas nervously asked the crowd. It was a confession that couldn't have been done any better, we say. Dumas' performance was more than a showcase of his unique folk sound; it was a revelation of his tremendous gift of storytelling. And as the one with this gift, he creates lyricism that speaks to and for the audience. 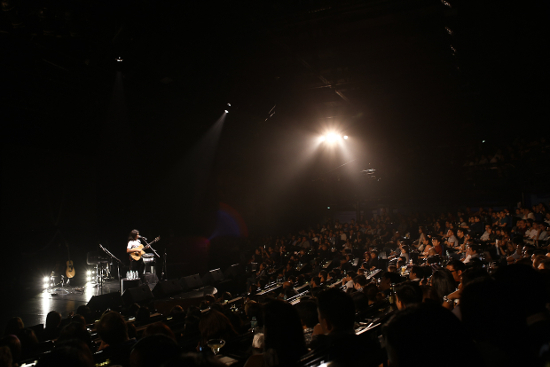 Danao stepped on stage and brought the audience to a mellower place with his smooth and cool vocals. He had the audience clapping and singing along as he opened with "Pagbigyan." Later on, he was joined by Dumas on drums for "Salubong," a touching track he composed for man's best friend. The guitar man and crooner played other favorites like "Ulan" and "Kahapon," and even incorporated lyrics of Eraserheads' "Ang Huling El Bimbo" in his performance of "Kung 'di Man." But it was with the love song "Ikaw at Ako" that the audience died. There's something about hearing the piece live, with a string quartet and keyboards that further tugs at the heartstrings. 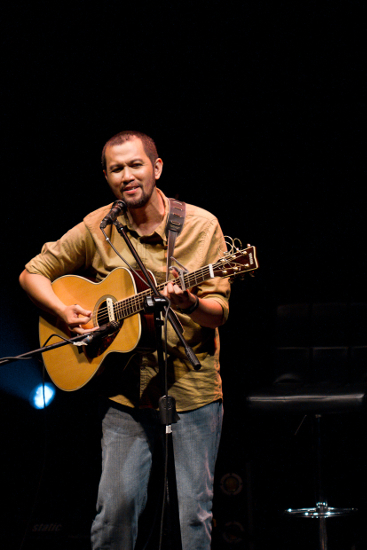 Danao is admirable not just for his coveted voice, but also for his passion, dedication, and humility. He has come a long way from being in a band to going solo and selling his albums himself as a walking record store—and he's definitely here to stay. 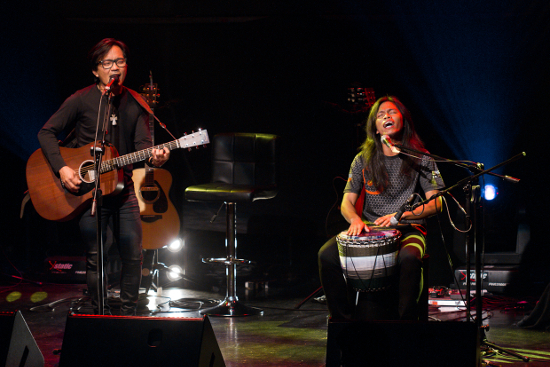 Dancel took everyone's breath away with his opening song "Kwarto." There's no denying this guy's powerful vocals, but what adds to the talent is the fire you see in him when he performs. 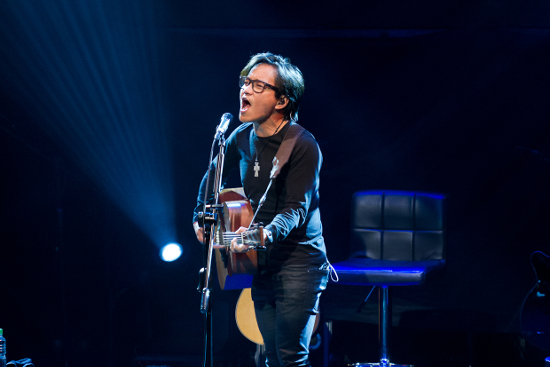 Even though feeling under the weather, Dancel wowed the crowd with his heartfelt performances, including "Wag Ka Nang Umiyak," "Paalam Kahapon," and "Tulog Na." 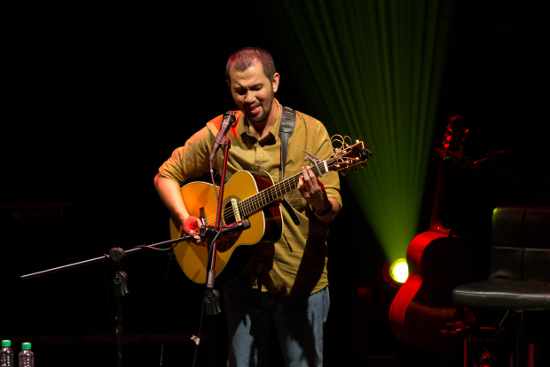 Dumas joined him for "Kasayaw," which Dancel lovingly dedicated to his mother. 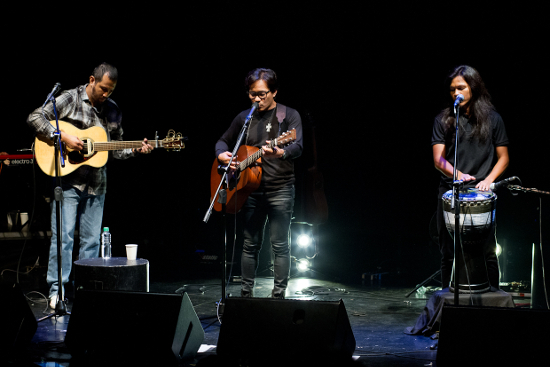 During his introduction of Dumas, Dancel told the audience, "I really believe in this guy. I really think he is the future of Philippine music." 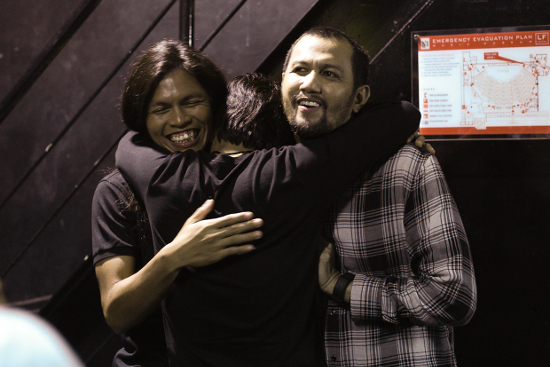 But Dancel not only used his voice to sing or praise his collaborators. He more importantly used it to deliver a strong message about clinical depression. Taking over the keyboards for the song "Bawat Daan," he shared, "Last year, through the help of my family, I went to a doctor and I found out I was very, very sick. The doctor found out I had a terrible, horrible, horrible case of clinical depression, or kung anuman ‘yong tawag nila...When I first found out about it, I cried to my Mama and said, 'I'm so ashamed,' and she said, 'I love you, and I'm here.'" He continued, "I say this now because there should be no shame in admitting that these things do happen, so if you feel it, please try to talk to someone. There's no shame in it. It's not your fault...If you ever lose your way, please do not lose faith and hope. Faith and hope are the two things you have, and may you find your way—as I would like to call it—back to happy.'" 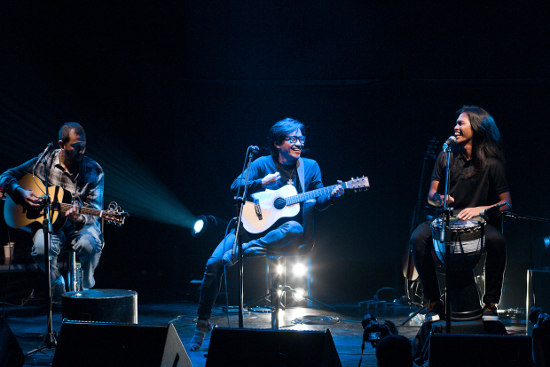 Danao, Dancel, and Dumas finally gathered on stage to the delight of the audience. 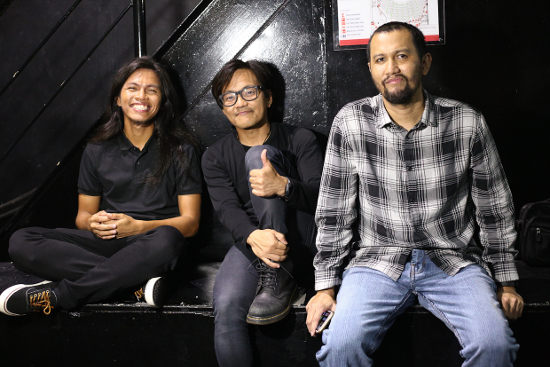 Each had their shining moment while covering the songs "Burnout" (originally by Sugarfree), "Iisa" (Gary Granada), and "Panahon Na Naman" (Rivermaya). And when it was time to call it a night, the trio received loud cheers and a standing ovation to the beyond satisfied crowd. DAMA was a great show of talent and coming together for the love of music. Even with a big venue—definitely a lot bigger than the crowded bars the three have been performing in for the past year—the show managed to be an intimate gathering of souls that, for one night at least, let themselves be vulnerable and just, well, feel. 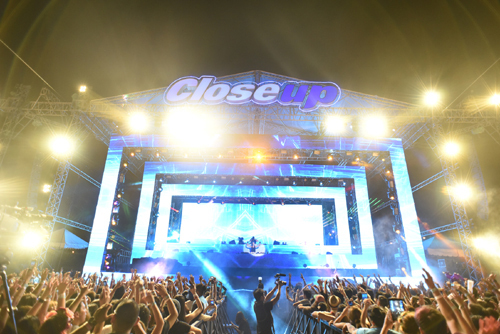 Calling all EDM fans: Party the night away with Dimitri Vegas and Like Mike in Manila!